🎅【 2018 UPGRADE FOR HOLIDAYS PROJECTOR LIGHTS 】① Holiday projectors have two projection heads,one for 10 RGBW ocean wave and another for 12 LED holiday pattern. Perfect for year-round use.② Projector lights are anti-fog & waterproof, works great even if rain or snow outdoor. 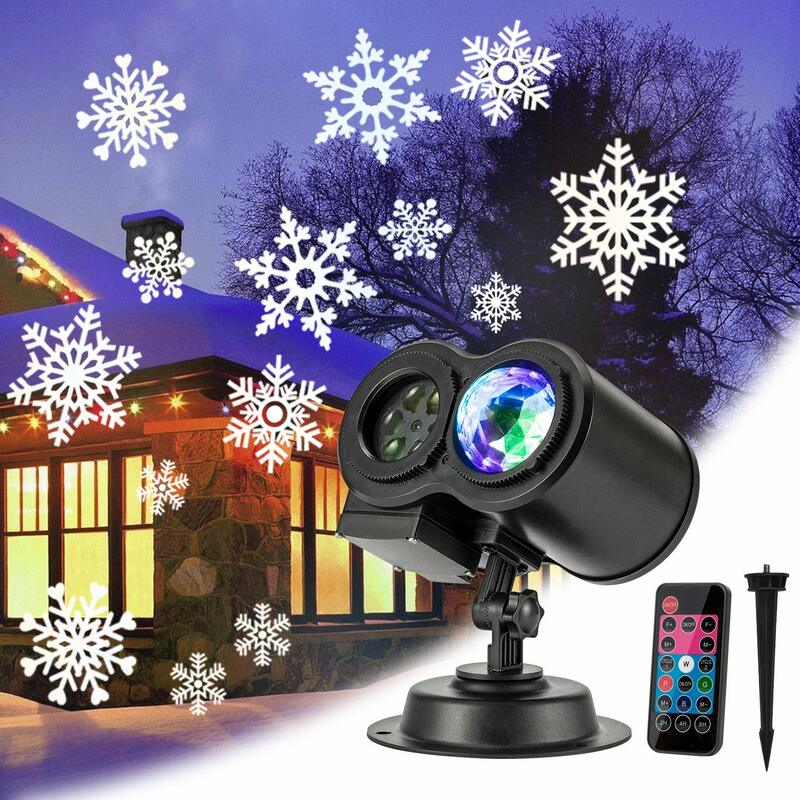 Images are clearer than other holiday lights.③ Christmas projectors with 2H/4H/6H timer & 3 modes design, super easy to use the projector lights by the remote control. 🎅【 12 HOLIDAYS THEMES 】These different slides of LED projectors lights, perfect to create happy atmosphere in outdoor/ indoor as decorations. The decorating slides are designed for holidays such as Thanksgiving Day, Halloween, Christmas, Easter Day, Valentine's Day, Wedding Anniversary, Children's Day, Birthday Party, Carnival Festival etc.The projected holiday images are much brighter, clearer and wider than others projector lights. 🎅【 REMOTE CONTROL & WIDE APPLICATION 】The wireless remote control of LED projectors to change lights color, moving speed, timer setting or flashing choice. Remote range up to 40ft. Remove the screw on the top of projector lights, then you can change the holiday slides you like, super easy to use! This xmas projector can be used as landscape lights,decorative lights,lawn lights, yard lights, stage lights and widely used in disco, clubs, KTV, bar, banquet, weddings, family parties, kids bedroom. 🎅【 LARGE PROJECTION & INDOOR/ OUTDOOR USE 】The projectors lights have 3 modes (ocean wave only, LED pattern only, ocean wave and LED pattern) ,which can cover super large area like a big house or whole bedroom (recommended projection distance is 26-32 ft).This ocean wave holiday light is 100% water resistant for outdoor use, 16.4ft long cable with weather-resistant cap, long enough to connect with power. Don't worry the images of holiday projector will be effected in the raining day. 🎅【 PACKAGE & 12 MONTHS WARRANTY 】 You will get 1 x LED Projector Lights, 12 x Holiday Slides of Projector, 1 x Remote Control of Projector, 1 x Power Supply Transformer of Projector, 1 x Ground Stake of Projector, 1 x Mounting Plate of Projector and others projector accessories. NO-Hassle 12 months money back/replacement warranty with lifetime. 12-hour response customer service. Buy Eiffelda with no after-sales troubles.